Keeping a clean grill is essential to good grilling. Dirty grill grates can contaminate food with unwanted flavors and bits of debris. This durable yet flexible grill brush allows you to get between the grill grates for a more thorough clean. No sharp edges, and no need to worry about metal bristles falling out, and will not melt like nylon grill brushes. The 10'' brush handle keeps you at a safer distance from a hot grill and also provides room for a second hand grip for better leverage. Suitable for all types of grill! Works with Char Broil, Weber, Big Green Egg, Porcelain, Ceramic, Gas Grills, Charcoal, Smokers, Infrared, etc. Use ZOUTOG grill brush after you've finished cooking, when the grates are still warm. Alternatively, before you grill, turn the burner to high, then brush the hot grates after the smoke clears. When you're done, this brush is dishwasher safe. Bring it inside and get it totally clean, instead of leaving it outside where it could attract critters and insects. Like any other piece of equipment, your grill must be maintained on a regular basis. By owning a quality grill brush, you're able to regularly clean your grate surface and keep it free of rancid grease and built up carbon. Cleaning while the grilling surface is warm can make the job easier, but remember to wait until the surface has cooled enough that it will not burn you. ♨ 3 in 1 Grill Brush: Clean 3X faster than ordinary BBQ brush. Clean your cooking grids without bristles, instead, use this Super Wave Grill Brush with wound stainless steel wire. No rough edges to cut you, and no need to worry about metal bristles falling out and getting in your food. ♨ Free BBQ Grill Glove: Free BBQ Grill Glove: with one pair disposable working glove, great for the industry, gardens, buildings, homes working, grilling and cleaning. One size fits more, durable cotton and non slip rubber design, protective your hand when working. 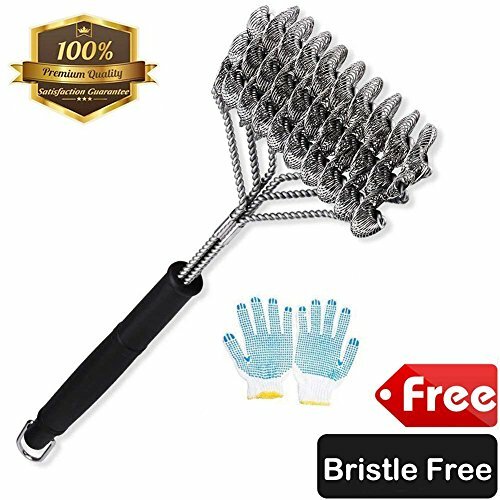 ♨ Bristle Free Brush: This innovative, bristle-free brush is a smarter way to clean your grill, easy to get the grease and food particles off the grill grates, removes stuck on food and sauce residue from your cooking grids, extending the life of your grill. ♨ Sturdy Handle: Scrub that grill, the 18-inch long brush provides the leverage you want to clean your grill while keeping your hands well away from the hot grids. Store this tool nearby with the convenient hanging loop. ♨ Compatible with Any BBQ Grill: Can be used with all types of grill, such as gas grill, charcoal, char broil, porcelain, ceramic, smoker and more. Conforms to your grates and grills for quick and easy cleaning. If you have any questions about this product by ZOUTOG, contact us by completing and submitting the form below. If you are looking for a specif part number, please include it with your message.